Here's a brown rice recipe collection which I hope will enable you to enjoy this valuable food. Brown rice has a reputation for being austere. But cooked carefully with the right ingredients to complement it, the reality can be very different. These recipes are suitable for brown rice and will hopefully whet your appetite for brown rice - which is generally a better dietary choice than white. But you can, of course, use white rice in any of these recipes. As a part of green living, you will doubtless want to use mainly organic rice, whether you opt for white or brown. Brown rice is an excellent source of carbohydrate, vitamins and some protein.It is especially rich in B vitamins. Organic foods are often better nutritionally - though not always. The main advantages are the lack of pesticide traces in the food and the fact that organic farming is far better for the environment. Please see Why organic? for more details on the benefits of organic food. There are concerns that some types of rice contain arsenic to an undesirable level. Some of this contamination is from naturally occurring arsenic in the soil and some is from previous use of pesticides. For more information on this, please see this consumer report. It is now recommended that you wash rice very thoroughly before use. These brown rice recipes include: simple cooking instructions for boiled brown rice; brown rice and veg with variations; brown rice salad with mushrooms and peppers; Bengali sweet kheer for dessert; some good books on rice and cereal cookery; instructions for safely reusing left over rice. Click here for recommended books on rice and other grains. The first thing about cooking brown rice is that it definitely takes longer than white rice. Think about 30-40 minutes on average. You can bring this down substantially by using a pressure cooker. 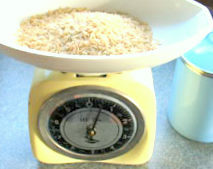 You should always either weigh out the correct amount of rice or use measuring cups. Also, measure the water carefully. This stops you ending up with gluey rice! It is greener and meaner than cooking with a lot of water in an open pan - a method you sometimes see recommended. This way you use less fuel and you don't usually need to sieve the rice at the end. Some people may prefer to wash the rice before adding the water. This helps to get rid of excess starch dust and reduce the brown scum which tends to arise as the water reaches simmering point. If you do this make sure you drain it adequately so that the water added is still the correct quantity. As mentioned above, it is now known that a lot of rice and rice products are contaminated with arsenic. For this reason it is advisable to wash the rice in plenty of fresh water before cooking. Eat rice (1/4 cup serving) no more than twice a week (adults). See the above mentioned consumer report for further details. Measure one cup of well washed brown rice into a heavy bottomed pan. This is enough for two or three adults or more, depending on the rest of the recipe. Add 2 and 1/2 cups of boiling water. Turn the heat on high and stir in the water thoroughly. A wooden spoon is ideal for this - or a chopstick. When the water comes back to the boil, turn the heat down so that the rice just simmers. Some brown rice will tend to develop an unpleasant looking scum: use a ladle to remove it. Alternatively, you can sieve the rice in running water for a few seconds and then replace the water you lost - but it's less easy to be sure that the quantity of water is right that way. Keep the rice simmering with the lid on until all the water is absorbed. With some pans you may need to keep the lid ajar to stop the whole lot boiling over. Simmer for about 20 - 30 minutes and check the condition of the rice occasionally. When the rice starts to look separated and a little dry on top it should be ready or near ready. Try a little. It should taste cooked or nearly cooked after about 30 minutes. In my view it's better to serve the rice a little "al dente" rather than overcook it. Switch off the heat and the rice should be perfectly ready to serve - fluffy and delicious. If you have a good quality pan (such as a cast iron or copper-bottomed pan) the rice should finish cooking to perfection even if you switch off the heat a little early. The next brown rice recipe has to be rice and veg. This dish is an absolute classic and is extremely easy and versatile. I always feel very healthy and well nourished after eating this. The balance of protein to starch is good and the dish is filling without being stultifying. Brown rice contains a significant amount of protein - nearly 8% by weight. It's also an excellent source of magnesium, something you won't find much of in white rice. Prepare the rice as above. Take a good selection of fresh garden vegetables- carrots, parsnip, celery, onions, kale or cabbage, peas and french beans, as you like. Start with the onions (or leeks). Chop them small and sweat them in a little oil - olive oil or sesame oil are both good. Prepare the other vegetables and slice the roots thinly length ways. (You don't have to do that of course, but it adds a nice touch.) They should end up looking like large match-sticks. Chop the othervegetables and keep them covered. Add the root vegetables to the onions and stir around. Start them on a high heat but quickly turn them down. This sears the outside and seals in the juices. Add in the lighter vegetables such as celery, kale, fennel after 7 minutes or so. Turn the ingredients frequently so that everything cooks evenly. You can also add in extras such as pre-cooked beans or raw nuts and seeds. This will increase the amount of proteins and desirable fats. Now put a lid on and continue to cook for about 8-10 minutes, depending on how well cooked you like things. The water from the celery and kale should prevent burning but it's as well to check the dish and give it a stir from time to time. Another approach is to add in a little extra liquid, such as homemade apple juice or cider. This will tend to make the dish a little sweeter. When the vegetables are tender you can add a few splashes of soy sauce. Use a good one such as Shoyu or Tamari. Serve immediately, piled onto the brown rice. A little tahini (a kind of creamy sesame seed spread - buy it in Turkish and Middle Eastern outlets) added at this stage makes a slightly richer dish, with a nice nutty flavour. 100% Organic Extra Long Grain Brown Rice can be bought inexpensively on-line in large or small amounts. To make a heartier meal add a few ounces of cooked beans. Butter beans, red kidney beans and pinto beans are all good. Make sure they are well cooked. You can add herbs and spices: a little chilli, garlic, parsley - flat leaved or curly are all good. Chilli and garlic can go in just after the onions. Parsley and other herbs are better added near the end of cooking. You can of course make a heavier meal by adding in some meat, fish or seafood. These can be cooked separately and added later, or you can add meat such as mince or diced steak just after sweating the onions. The dish takes longer to cook of course. Add the light vegetables 7 or 8 minutes before you want to serve the dish. This brown rice recipe is capable of almost infinite variation; Stick to the principles of what goes in when and let your imagination fly! You can make an almost endless variety of salads using rice, white or brown. 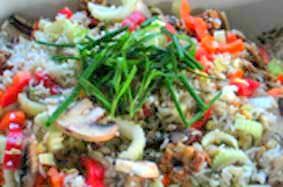 Here's a nice brown rice recipe for a nutty salad which is very easy to prepare. Cook the rice as described above. Roast the nuts lightly before chopping. Allow them to cool. When the rice is cool add all the ingredients and toss them together well. Add a light garnish of herbs to the final dish before serving. Here’s a great sweet recipe for rice. I’ve only tried this dessert dish with white rice so far but I can see no reason why it should not work equally well as a brown rice recipe. Put the milk, rice and bay leaf into a large pan. A non-stick pan will be easier here. I used my trusty cast iron pan which was OK. You could use an enamelled pan if you are careful to stir plenty. Cook the mix on a fast heat until boiling point is reached. Lower the heat and keep the mix at simmering point for about 40 minutes – or until the mixture thickens. You should it stir often with a balloon whisk or a wooden spoon to prevent the milk from burning on the bottom of the pan. This is quite labour intensive but if you stir it from time to time while you are minding other cooking tasks it is quite easy to do. Take out the bay leaf and add the sugar, raisins and cardamom. Kheer is normally served cold, so if you want to eat it that way let it cool and then put it in the fridge overnight or for a few hours. It will carry on thickening a little as it cools. The last time we made it we were too impatient to wait for it to cool! Just set it out into bowls and let it cool for a few minutes. It will then have a wonderful consistency and texture. It is great with a little fresh cream poured over each bowl. This is absolutely delicious. If you are making it for small children you might want to remove the cardamom pods before serving. Here is some good reading about cooking grains and getting the best from them. Read on below for more brown rice recipe ideas. The Splendid Grain: Robust, Inspired Recipes for Grains With Vegetables, Fish, Poultry, Meat, and Fruit The writer studied with macrobiotic teachers and has developed her own unique style. There are many brilliant recipes from the simple to the exotic, including dessert recipes. "An awesome resource". 366 Delicious Ways to Cook Rice, Beans, and Grains A recipe a day and many of them spicy and exotic. Some European and American favourites too. This book is a thorough resource book with plenty of nutritional info too. Whole Grains Every Day, Every Way Lots of really detailed information about the different grains with mouth-watering recipes. There's nothing bland about these recipes - even though they are definitely good for you! Rice which has been cooked and then stored in a refrigerator can easily be re-used in another dish the next day. The best way to do this is to add a little cooking oil and a little water before heating it gently in a heavy pan. Keep the rice moving by stirring it with a wooden spoon or chop stick. This keeps the rice nice and moist and helps it steam through as it heats. You can also re-heat rice effectively in the micro-wave in a similar fashion. Just put it in a closed micro-wave-safe bowl and add a little oil and water - just a dessert spoonful or so. Reheat it on full power for about one or two minutes, depending on the amount. Check that it is heated through and piping hot before serving it. Be very careful that re-used rice is fresh enough. Old rice is notorious as a source of food poisoning! It's best to use it only after a day and only if it has been stored in a fridge. It is the storage which causes the problem, not the re-heating, so make sure your re-heated rice is fresh!It's also worth noting that spoiled rice does not lose its taint through heating! It will still give you food poisoning - so always take great care with any re-heated rice dishes.